The Best Ever Homemade BBQ Sauce Recipes - Is It Possible? In the last 10 years we've created something on the order of 40 different bbq sauces. We've made it hot, mild, salty, sweet, spicy, rich in flavor and of course smooth with taste not to mention the natural and gluten free versions. We've done this for small and large companies alike. But nowadays the divisions between styles of barbecue sauce are even more clear than they were some 5 or 7 years ago. We with advent of cooking shows and popular websites the variations around a particular style are far and few between. Most differences range between the amounts of salt added and the additions of things like ground onion and garlic versus amounts of molasses. So, with all that's happening in the barbecue world we thought we would give you a leg up by teaching you How To Make Homemade BBQ Sauce Recipes from the most popular styles of bbq sauce that are out there on the market today. Keep in mind these are traditional recipes we learned from each of the states. Further we thought who really wants to sit and read...anything, anymore? So, we decided to put together a video. This How to Make The Best Ever Homemade BBQ Sauce Recipes videos and Recipes show you the steps you need to make great homemade BBQ Sauce. 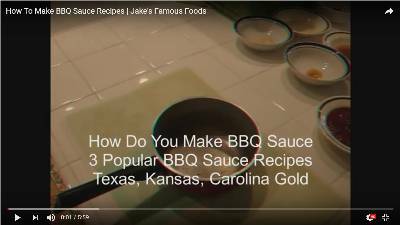 video teaches you the ingredients and process needed to make Texas, Kansas City and Carolina Gold BBQ Sauce. This is a no frills approach to making these bbq sauces. We show you in short order by adding each of the ingredient elements and further labeling the elements on the screen. Because this is a video now on YouTube you can pause or play forward the video anytime you want. Catch all the relevant elements for making the type of bbq sauce your want or just speed ahead to the next. Open the video, review the steps first then come back and copy down the information. Or, just play the video while in your kitchen as you've gathered all the ingredients. With time we hope to be make additional videos as instructional aids, we've been in the barbecue business for a lot of years and there's a lot of knowledge we believe can help anyone from novice to expert griller. So, take a look at the video, send any comments on the information or production values and we'll work toward incorporating those comments as we produce more videos. We hope you find this information on How to Make BBQ Sauce Recipes useful. We believe the ingredient process for this video and the resulting sauces is relatively easy. Most of the ingredients can be found in the average kitchen cabinet. Specialty items might be on the order of Molasses or White Wine Vinegar but there are substitutions which can be made for these items if you don't have them. Once the sauce(s) are made you can store them in a container in your refrigerator for at least a week or more. Just reheat after removing them from the fridge and your sauces are just like new. BBQ Sauces can be marinated on ribs or chicken beforehand and will produce exceptional results when grilled.